Air India Boeing 787-8 Dreamliner line number 35 test registered N1015 (later became VT-ANH) at the India Aviation show, Hyderabad March 2012. Photo copyright Devesh Agarwal. 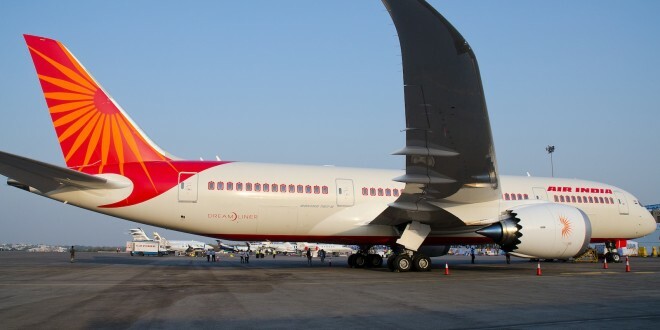 I looked forward to my first Dreamliner flight with considerable excitement, and with some trepidation, since I gave up flying Air India in 1997. Made the booking via the Expedia website. An okay experience, but given a choice, I would make the booking directly on Air India website. I had web checked-in a day earlier, so I arrived at the airport around 09:00 in a relaxed state. This soon turned to absolute panic, when I discovered I left my wallet at home, along with all my money, credit cards, debit cards, ID’s etc. Luckily I borrowed my son’s debit card and withdrew some money at the airport. My airport photographer ID badge lying in my camera bag bailed me out. Check-in was smooth. Efficient, well dressed, well groomed, and courteous staff behind the counter. Hello Sir. Good morning. Thanks for flying Air India. Huh?!?!?! Is this Air India? When did this begin? Nice!!! I also discovered that Air India allows you to check in 25kg against the 20kg norm on most domestic carriers. Check-in wait time: 1 minute. Check-in time: 30 seconds. and I was on my way to security. Browsed through the restaurants, but the menu choices were limited, and the Indian fast food restaurant keep telling patrons “Sorry, this is not available, that too is not available”. When 2/3rds of your menu is not available, it is time for the airport authorities to look in to this matter. And other readers of Bangalore Aviation have complained to me in private about the lack of food choices in Bangalore. Bought a bottle of water. 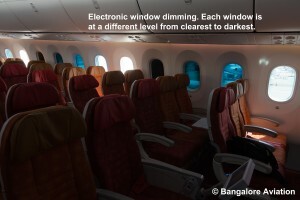 Electronic window dimming on the 787 Dreamliner. Strolled around the crowded departure lounge and arrived at the gate around 09:30. Here one can see the over-employment prevailing at Air India. About 12 staff mulling around the counter. 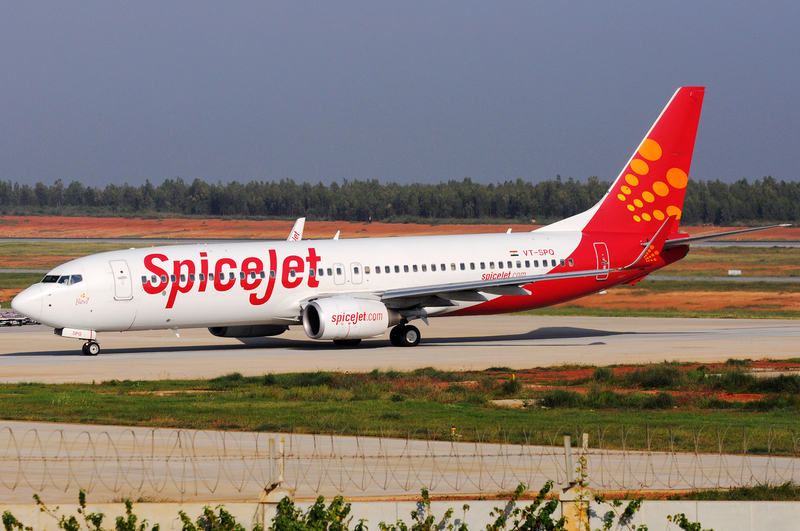 Compare this to one at IndiGo, India’s most profitable airline. Soon enough the aircraft pulled up to the gate. At boarding we experienced the old Air India mismanagement. A haphazard, single line for boarding a full flight of over 225 passengers. People just cutting in to the line, while the 12 staff, including some managerial level, just stood there watching the show, either completely uninterested, or walking around like mindless automons not knowing what to do. Despite announcing boarding by row numbers, the staff kept allowing passengers to board regardless. Being Dussera, the flight had its share of young mothers with equally young toddlers and infants, adding to the overall confusion. Rely on me to lead a group of passengers who goaded the ground staff in to some action and forcing them to impose discipline. We experienced a 25 minutes delay, only due to the shoddy boarding. Thanks gate guys, you ruined the otherwise good airport experience. The tinted view outside the window. We were welcomed with a smile. I got a seat over the wing. The electronic dimming windows are kept dimmed, casting a dark pall on the interior. The crew briefly brightens up the windows at take-off and at landing to comply with safety regulations, otherwise, the windows remain at 50% tint through the flight. The cabin crew later informed me, this was being done after passengers on the Delhi Dubai flights were found repeatedly punching the window shade controls to the point of ramming the buttons into the panels and breaking them. Below is a video of the electronic window dimming. The aircraft is seriously quiet. I took this video at take-off and keep in mind, I was sitting right next to the huge GEnx engine. Air India domestic economy class brunch. 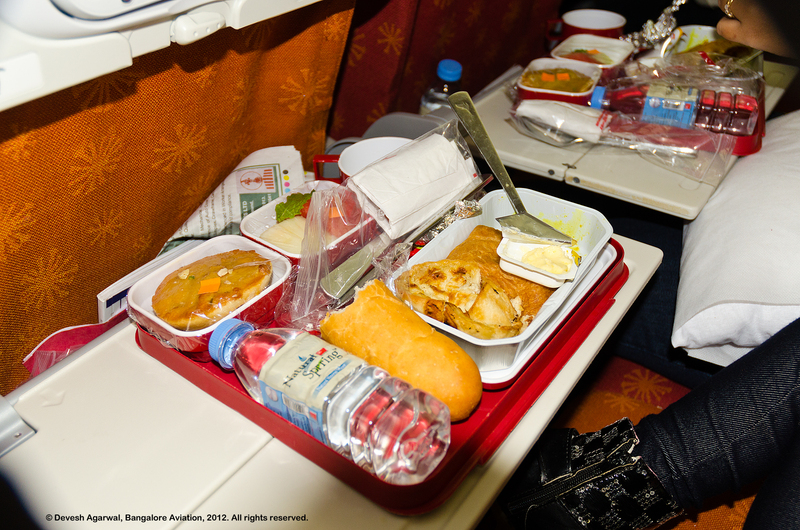 Air India cabin service is traditionally inconsistent. We were lucky, this flight had the cream of the crop and we were well treated, even by international standards. The attitude of the sky-aunties on the return flight would stun a team of oxen in their tracks, but that is a separate story. About 30 minutes after take-off we were served a brunch. The food was above par compared to other domestic airlines, moist, tasty, and well heated. After the meal service, I chatted with the crew and heard their horror stories on the boorish behaviour of passengers who fly Air India, mostly on the middle-east sectors. 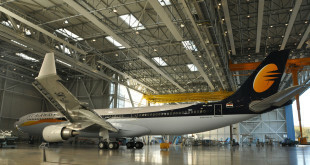 Also heard about the constant grounding of the Dreamliners due to various technical faults. (My return flight which was also to be on a Dreamliner was changed to an A330-200 VT-IWB due to a Dreamliner grounding). The in-flight entertainment is an AVOD (Audio Video On Demand) touch screen system by Thales. It has its bugs, but, by and large, performed well. Content is decent. One of the map views on the system is unusual. 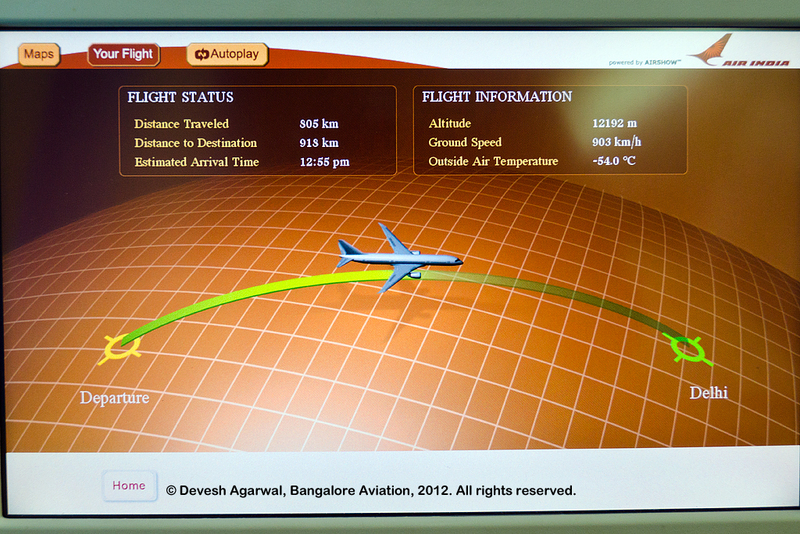 Air India Boeing 787 Dreamliner moving map display. 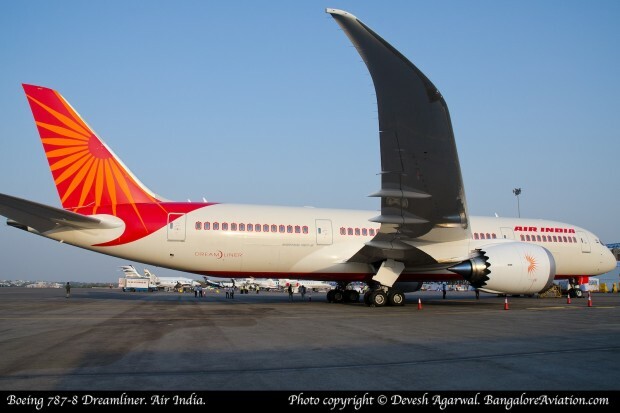 Air India has a very comfortable economy class seating in its Boeing 777 fleet, but for its Dreamliners, the airline has opted for a tight, nine abreast, 3-3-3 seating. The seats are narrow and uncomfortable. Even my daughter who weighs only 50 kgs, complained of the seats. It is okay for small to mid-sized (up to 75kg) adults. I was able to survive only because the middle seat next to me was occupied by a precocious five year old, and I was able to steal about two inches from her seat by raising the arm-rest. The narrow arm-rests also pushes the window seat in to the side panel and broad shouldered persons like me get pushed away from the side wall and have to sit tilted. 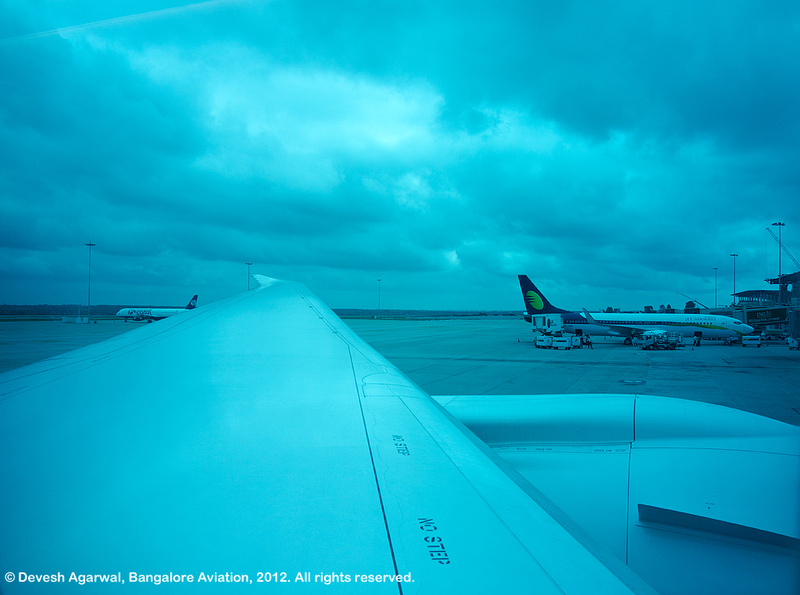 You would be well advised to stay away from the window seats, or better still, away from the Dreamliner all together. 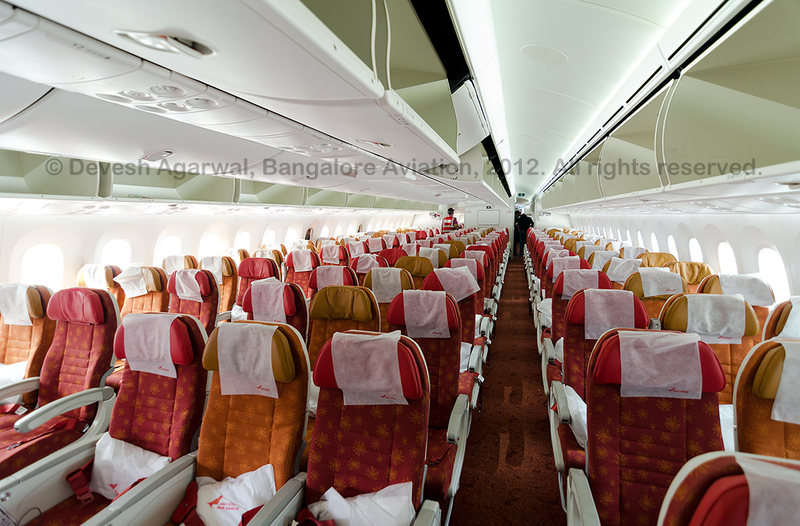 Air India Boeing 787 Dreamliner economy class. Unfortunately, most airlines, including Qatar Airways have opted for this bone-crunching, high density, 3-3-3 seating. How passengers are going to survive long trips in this aircraft is beyond me. In this respect the Dreamliner is positively a Nightmareliner. We arrived in Delhi 25 minutes late, and taxied around Terminal 3. There were over 50 ground crew waiting to receive the aircraft (yes we know Air India is an employment paradise). Yet it took the crew over 10 minutes after chocks on and engine off to open a door. We all had to exit via the rear since the aircraft was docked at an international gate. Hurriedly took a few shots of the cabin in the bright sunshine and exited. Boarded a bus, driven by a potential candidate for the upcoming Formula 1 New Delhi Grand Prix weekend. Never knew a bus could be turned at 5Gs.